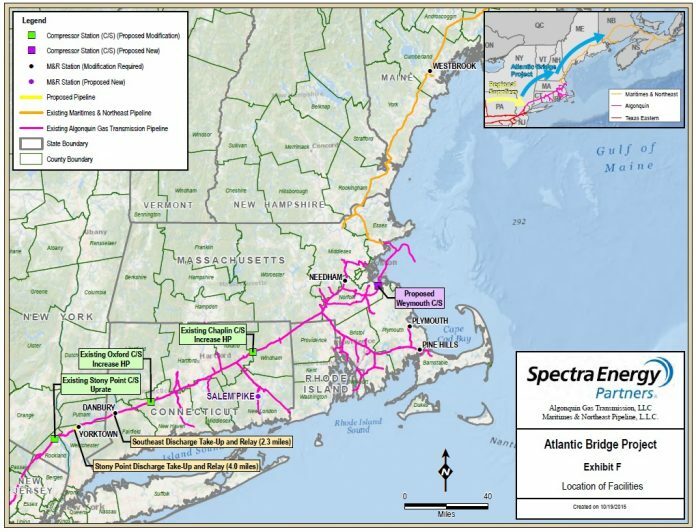 Map courtesy of Spectra Energy Partners. 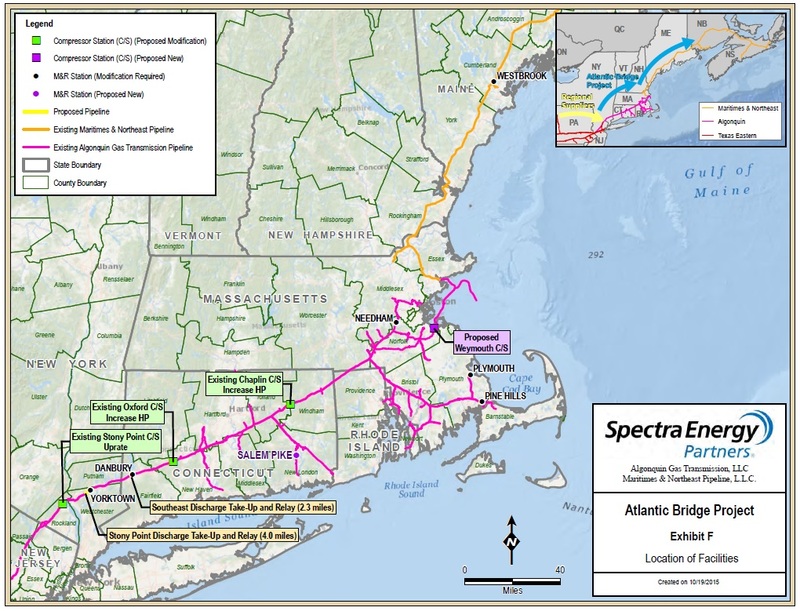 Algonquin Gas Transmission LLC (Algonquin) has placed into service gas compression stations and other facilities associated with its Atlantic Bridge Project. The project included modifying three existing compressor stations resulting in the addition of 18,800 hp (14,024 kW) of compression and construction of a new compressor station resulting in the addition of 7700 hp (5744 kW) of compression. Stony Point Compressor Station – uprating an existing Mars 100 compressor unit, by removing a software control, to utilize an additional 3300 hp (2461 kW) of horsepower capacity at Algonquin’s existing compressor station in the Rockland County, New York, USA. Oxford Compressor Station – installing one new Solar Taurus 60 natural gas-fired compressor unit rated 7700 hp and gas cooling for the new compressor unit at Algonquin’s existing compressor station in Haven County, Connecticut. Chaplin Compressor Station – installing one new Centaur 50, 6300 hp (4699 kW) natural gas-fired compressor unit, replacing two existing 42-ppm NOx Taurus 60 gas-fired compressor units (6950 hp [5184 kW] each) with two new 9-ppm NOx Taurus 60 gas-fired compressor units (7700 hp each), and installing gas cooling for the new compressor unit and existing compressor units at Algonquin’s existing compressor station in Windham County, Connecticut. Weymouth Compressor Station – a new compressor station utilizing one Solar Taurus 60, 7700 hp natural gas-fired compressor unit in Norfolk County, Massachusetts.